The use of iPads in education is relatively new – this mornings email carried a couple of articles about how they can be used. The two diagrams in this post provide a graphically illustrated map of how they are being used to engage with students. These have been devised focusing on use in secondary education. For Uni’s UWS has been one institution leading the way in introducing the iPad through its 1st year program. I wish I had been given an iPad when I started Uni ( ok when I stated Uni even desk tops were new 😪). So when Matthew Riddle approached UWS about participating in his research project I was more than happy to participate. I have offered to be interviewed ( no we don’t get the $25 iTunes card 😓) and have circulated via email yesterday Matthew’s invitation to be part of his project. I hope that a number of you take up the invitation, not just for the money, but because research is a major purpose of Universities. Being part of any research project is interesting as the researchers try and understand a little bit more about our world. Participation will also help your understanding of aspects of this unit and the difficulty of understanding the consumer. 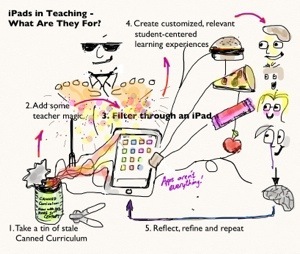 So iPads in education, they are still new, we are still playing, are they better? Different? A diversion? A toy? Groundbreaking? Only time will tell – BUT they are fun. Let us know what you think – leave a comment.